There would never be another Homecoming game like it. On the 80-degree afternoon of Oct. 18, 1924, some 67,000 raucous fans, jammed into a newly dedicated Memorial Stadium, waited in suspense for the start of the contest against a powerhouse Michigan team. A whistle sounded, a cheer arose, and the Michigan captain kicked the football. It was a low kick, and the ball, spiraling northward through the sun-washed sky, plopped into the outstretched arms of Harold “Red” Grange ’26, who stood on the five-yard line of the emerald-green field. “Cautiously, almost shyly,” the bare-legged Grange embarked upon the famous 95-yard run that would win him sports immortality. Starting on his left, he quickly dodged to the right to avoid a tackler and then again swerved left. He had outflanked his befuddled Michigan opponents, extricating himself from “seemingly hopeless tangles of tacklers,” and an open field lay ahead. Grange sprinted into the end zone, and the bleachers “went crazy,” the fans standing up and trying to “split their throats cheering.” He wasn’t done that day – far from it. Grange scored three more times that quarter – four touchdowns in 12 minutes – and the Illini would go on to crush Michigan 39-14. Like the fabled runs of Red Grange on that distant autumn afternoon, Homecoming at the University of Illinois has enjoyed many memorable twists and turns in the course of its 100-year history. “I’d like to do something really big for the old school before I leave,” one supposedly said to the other. The story is a good one, but it contains at least one inaccurate detail: Williams claimed that the conversation on the YMCA steps occurred in April or May of 1910, but by that point, the movement for a University Homecoming was already well under way. However the idea originated, on March 13, 1910, members of the two senior honorary societies – Shield and Trident as well as the Phoenix – assembled in the basement of the YMCA and resolved to urge the Council of Administration, the University’s central body for student affairs, to sanction an annual Homecoming. 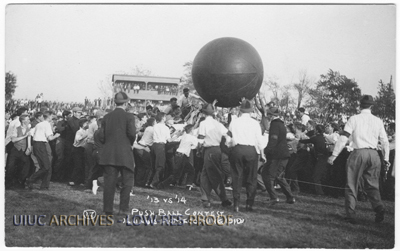 The Friday events of the “jollification” – a match between the Illini baseball team and alumni all-stars, a pushball contest between freshmen and sophomores (in photo above), the Hobo Band (comprising colorfully and often outrageously dressed students) and a mass meeting – were all but a prelude to the Saturday pigskin duel between the Illini and the University of Chicago Maroons. 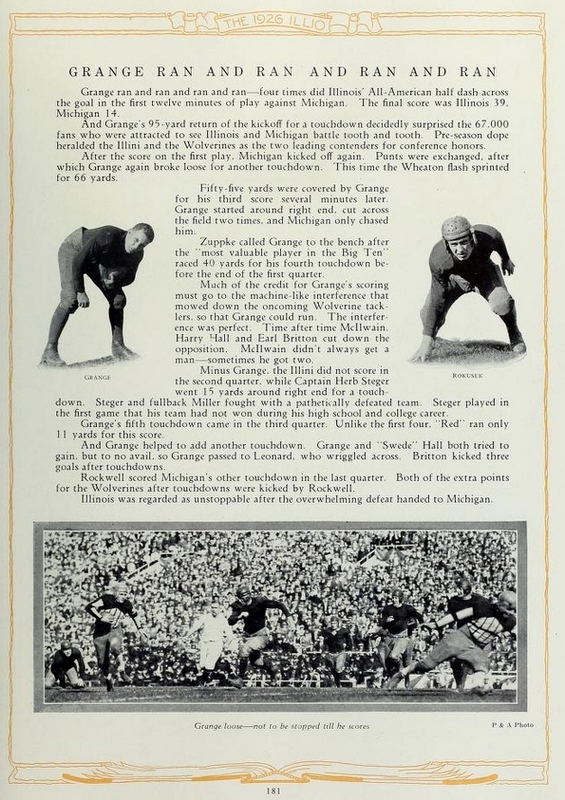 Thousands were packed into the rickety grandstands and temporary bleachers of Illinois Field, including an organized “rooters’ section” of undergraduates selected for “their peculiar rooting ability and attired in Orange and Blue dress in a manner that formed a block ‘I.’” To the surprise of many witnesses, the Illini “outplayed and outgeneraled” the Maroons on that warm and dusty day. The echoes of the events of this great Home-coming will be heard as long as the University endures, for it is now almost a certainty that it will be adopted as a permanent annual institution the like of which no other University can boast. Illinois may well pride itself on being the originator of the plan for drawing home the alumni, a plan which will undoubtedly be adopted generally. In 1911 the Council of Administration endorsed the idea that Homecoming should be an annual affair. This decision did not please all alumni, a fact that became evident at the second Homecoming, when the New York alumni made known then their belief that the annual class and alumni reunions should continue to be held during Commencement Week. Strongly agreeing with the New Yorkers was J.N. Chester, Class of 1891, of Pittsburgh, who suspected that Homecoming “had been planned and promoted by the Athletic Association in order to increase its gate receipts at the football game.” Of course, Chester’s statement is exaggerated, but one cannot deny the importance of football to Homecoming. So the hiring in 1913 of Robert Zuppke ’38 as football coach may have been one of the best things that happened to the UI Homecoming in its early years. Later described as “a truly magnetic, dynamic personality – the personification of pep and fight,” the 33-year-old Zuppke quickly revived the flagging football fortunes of the Illini. In his first 17 years as coach, Zuppke would lead his teams to win seven Western Conference championships and compile a remarkable 90-29-8 record. Not coincidentally, attendance at the Homecoming games soared in the wake of football success. Held on Oct. 31-Nov. 1, 1919, the so-called “Victory Homecoming” fully lived up to the expectations of the Alumni Quarterly. An estimated 12,000 alumni returned to the old Alma Mater; some parked their cars in the Armory, which had been pressed into service as a garage. The alumni enjoyed an elaborate Homecoming program that featured old favorites like dances, the pep rally, reunions, the Hobo Band and innovations like a Coed Carnival, whose vaudeville-type program would later become known as The Stunt Show. On Homecoming Saturday, the Illini thwarted Chicago in a 10-0 upset before a crowd of 18,000. That evening a crackling bonfire on Illinois Field and a booming fireworks display ended “the Greatest Homecoming” in a blaze of glory. 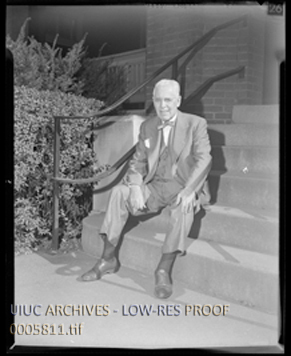 John Franch, “History of Illinois Homecoming: Origin - 1919,” ExploreCU, accessed April 19, 2019, https://explorecu.org/items/show/260.